Large WIDE size 1 inch fold over elastic. 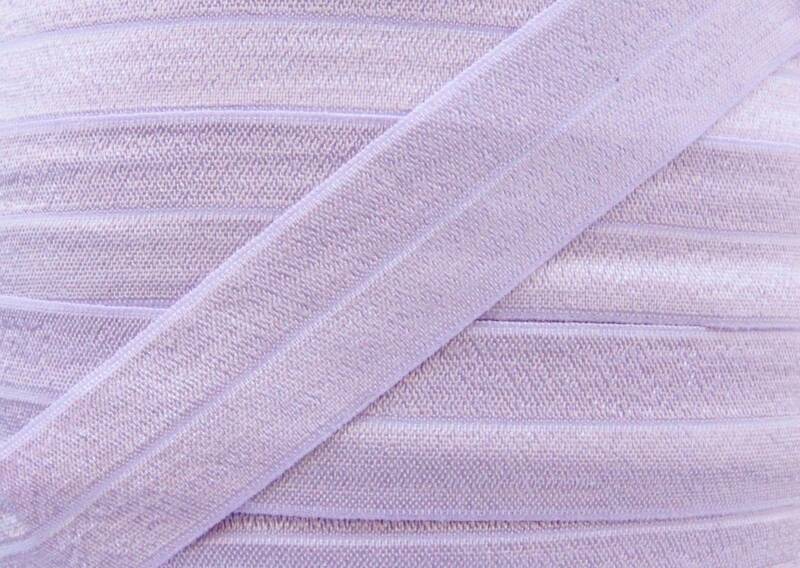 5 yards of soft and shiny fold over elastic (FOE) in Lilac Mist. The elastic is shiny on one side and matte on the other. Perfect for fun hair accessories and dramatic headbands! 12 month- teen - 17"
I am very happy with my purchase.the colors are vibrant and I can't wait to use them! We accept PayPal and all major credit cards through Etsy Direct Checkout. All e-Check payments through PayPal must clear before we process your order. E-Checks may take 5 days or more to clear from your bank. Texas residents will be charged sales tax at checkout. You can cancel an order within 12 hours of payment, however once your order has been packaged and shipped we can not accept cancellations or refunds. We DO NOT accept returns. ALL SALES ARE FINAL. Exchanges may be made within 5 days of receipt. Items returned must be new, unworn, and undamaged for refund. Refund will not include shipping costs. If your item is broken or faulty you have 5 days of receipt to report the damaged item. We will send a replacement or refund your order. If your item arrives damaged or incorrect please contact us and we will work to correct the issue. Items may have slight color variations from photos. We will NOT refund your order due to USPS shipping errors or mistakes. We have NO control over the USPS system, transit or operations therefore can NOT claim responsibility for their mistakes. You can always add insurance to your order at checkout. Coupon codes vary from time to time, you must use your code at the time of purchase. We cannot refund or re-credit after the transaction is complete. All domestic orders will ship either USPS First Class Mail, Priority Mail or Express Mail. These shipping day averages are not a guarantee. WE ARE NOT RESPONSIBLE FOR LONGER TRANSIT TIMES DUE TO USPS ERRORS. Transit times vary city to city and can vary due to holiday volume or natural disasters. WE HAVE NO CONTROL OVER TRANSIT ONCE IT LEAVES OUR FACILITY AND ARE NOT RESPONSIBLE FOR LOST OR DELAYED PACKAGES. You will receive a tracking number in a separate email once your order has shipped. We ship internationally by USPS FIRST CLASS MAIL. This is the most affordable method of delivery, however it DOES NOT come with tracking or insurance. YOU are responsible for TAXES & DUTIES in your country. You may add tracking by upgrading your shipping to priority or express. WE HAVE NO CONTROL OVER TRANSIT TIMES, CUSTOMS OR DUTIES. WE CANNOT CHANGE OUR DUTY FORMS SO PLEASE DO NOT MESSAGE ASKING. Transit times vary for international orders depending on your country. In most cases transit varies from 2-4 weeks. Again, WE HAVE NO CONTROL OVER TRANSIT ONCE IT LEAVES OUR FACILITY AND ARE NOT RESPONSIBLE FOR LOST OR DELAYED PACKAGES. Times vary based on holidays and busy seasons. These are not guaranteed transit times. Your package will be carefully wrapped and protected for transit however, WE ARE NOT RESPONSIBLE FOR LOST PACKAGES OR LATE/DELAYED USPS TRANSIT TIMES. We suggest to add insurance to your order if the package is lost or stolen. We will not refund an order sent to the incorrect address. You are responsible for entering the correct address at checkout and are therefore responsible for payment of all shipping and processing fees that apply to us to reship your items to the correct address. Please note: Accessories and goods may contain small pieces. We take extra care to ensure they are secure, however there is always a chance they could detach. Adult supervision is required when a child is using or wearing or around the accessories and materials. Photos and descriptions of items are property of Couture Craft Supply and its owners. Any photos and/or descriptions used without permission of Couture Craft Supply and/or its owners could be infringing on copyright and trademark laws and may be reported to Etsy and likely be contacted by our attorney. DO NOT STEAL pictures or copy designs created by Couture Craft Supply and its owners.